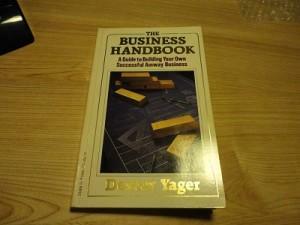 This post provides a review of The Amway Business Handbook by Dexter Yager. Most of you know that I am a former Amway distributor. I am not disgruntled or angry. I actually enjoyed my experience. I’ve been out of the business for about 12 years now. It was my first network marketing company and I learned a lot from the experience. Quite perhaps the most famous distributor in Amway is Dexter Yager. He has built a team with MILLIONS of distributors and customers. He could easily be labeled as the most successful network marketer of all time. He’s been with Amway more than 50 years now and he has a DYNASTY that any network marketer would be proud to have. I recently stumbled across one of his books in a local thrift store. I got a lot of 10 books for $1 and this was one of those books. Talk about a great deal. The book looked interesting to me so I bought it. I buy any network marketing book I can find, especially when they are written by a famous distributor. I read it over a period of one weekend and enjoyed it immensely. Although my edition is approximately 30 years old, the information is relevant and helpful. Overall, I give the book a 9 of 10. What I want to do in the paragraphs below is share some of my favorite quotes from the book. Each quote is in bold and italics. They are listed by where I found the quote in the book. At the end of each quote I also share my own two cents on the topic. # 1 Most people, if asked to name the greatest single benefit in life, outside of life itself, would probably say freedom. In my opinion, freedom is the most important word in the English vocabulary. Without freedom you have nothing. # 2 There are no jobs which offer ample amounts of both time and money. I don’t believe that jobs are bad, but I do believe they are a bad vehicle if you want time and money freedom. # 3 But the greatest, most motivating dreams will have little lasting effect unless you determine a specific plan of action. A dream is nothing more than a thought until you write it down on paper, set a deadline of when it will be accomplished by, and create a game plan to make it happen. No one gets paid to recruit people. If end users don’t consume the product, you won’t earn a penny. # 5 Sponsoring, either personal or in depth, is the key factor in making that multi-generation business into a long-term success. New recruits and new customers are the lifeblood of your business. # 6 Any organization rises and falls with its leaders. This is a business of leadership. You are only as good as your own leadership ability and the leadership ability of your team members. # 7 Practice delayed gratification. This is something that is very difficult for most people to do. # 8 It’s the dream that you need to share. That’s what incites potential distributors to action. Whenever you show a plan, make sure you spend the time to find out what the other person wants, before you explain the business. # 9 All you need is 6 active distributors. Your goal is to find six people who want to build a big business and are willing to put in the work. You will probably have to sponsor 100 or more people to find these six people. # 10 In fact, the fastest growing leaders generally only work with 2 or 3 hot personally sponsored distributors, and usually only 3 to 5 in depth under them. You can only effectively work with a few people at one time. Everyone is responsible for their own group. # 11 You don’t have to be a miracle worker to make this thing work, you just have to be a believer and a doer. Success boils down to hustle, work ethic, consistency and persistence. # 12 Time is your most valuable asset, don’t waste it. Once your time is spent you can never get it back. # 13 I am of the opinion that the curiosity approach, in whatever form, is the best. Pique people’s interest and when they sit down with you show them a complete presentation. # 14 Any motivated person will soon see that his business will not grow until he gets on the board for himself. The person with the marker makes the most money. # 15 Quite frankly, the most important part, especially the first time your prospect sees the circles, is the dream. Find out what your prospect wants and show them how the business will help them get it. # 16 Discouragement and lack of persistence are the two greatest enemies you will face. Things never go exactly as planned. You have to do the work, stay the course and make adjustments along the way. # 17 Just remember, it is much easier to build the business fast, rather than wallowing around the mundane ruts which others want to drag you into. Take massive action right out the gate. # 18 Develop the need into a want. She may need the products you are showing, but until you change that need into a want, you will probably not make the sale. # 19 Establish 10 to 20 regular customers. Service them at least twice a month. Every distributor should have a solid customer base. This helps legitimize their business. All businesses need customers. # 20 The key is duplication. We say that building your Amway business boils down to teachers teaching teachers to teach. You get paid to teach people to teach people to teach people. # 21 You have not effectively duplicated yourself until that new person is becoming successful at sponsoring, moving products, and teaching. Sponsor and teach. That is your job. # 22 …Until you are growing in depth, you are merely involved in direct sales. This is a business of duplication, with a lot of people doing a little bit, rather than one person doing a lot. # 23 The leader may not be your frontline distributor, but may come in depth; still you must back up that leader with another leader. Treat every serious person your team as if they are personally sponsored by you. Typically, your best people are sponsored by other people. # 24 Depth brings security. Width makes you immediate money, but depth gives you long term security. # 25 When you are building in depth, the income will almost always be two to three months behind your growth. Don’t be put off if you don’t make immediate income from today’s work. Results follow activity. # 26 … You cannot build anything worthwhile, nor can you attain higher levels, unless you are willing to teach others everything you know. Don’t hoard information. Transfer your knowledge to your serious people as quickly as possible. # 27 Don’t expect your downline associates to do something that you aren’t doing yourself. Lead by example at all times. Set the pace for your group. # 28 Excitement breeds excitement. Get excited. No one cares as much about you and your future as you do. # 29 People want to be part of something that is challenging, rewarding and exciting. Make the business fun. Create a culture so people WANT to stick around and be part of something greater than themselves. # 30 Often your people will build their business on the purse strength of your belief in them, even when they don’t believe in themselves yet. You must cast belief into others until they believe in themselves. # 31 In fact, one of the most wonderful parts of this business is the relationships you will from through the years. This is a true relationship business. The people who make the most money have strong relationships with the most amount of people. # 32 When you make contacts for your business, seek first to be a friend. # 33 You become like the people with whom you surround yourself. You are a reflection of your five closest friends. Choose wisely. # 34 We must learn that obstacles are in our way to strengthen us. # 35 Weariness does not come so much from overwork as from a lack of interest in what you are doing. When you put in the work, you will build your conviction in the business. Do nothing and your business will die a quick death. Dexter Yager is a legend in the Amway business. He is also a very successful entrepreneur in his own right. He owns many different businesses in North Carolina. He is the ultimate success story. In review, “The Business Handbook: A Guide to Building Your Own Successful Amway Business” by Dexter Yager is a great read. Whether you are in Amway or a different MLM Company, I suggest you pick up a copy of this book and study it. Even though it was written several decades ago, the information is very relevant and helpful. What is your favorite quote on this list? Have you read “The Amway Business Handbook”? Disclaimer: Amway is a registered trademark. I am in no way affiliated with the company. This sounds like a great book with a lot of insightful information. I agree with so much of what he has to say, especially his thoughts on freedom. What if more people started thinking like him? It seems the world would be a better place. I really appreciate that you like to share your what you find with your readers. Yes, I loved this book and I mailed you my personal copy. I hope you enjoy it as much as I did.